What is key when looking for digital door labels? Facility management is going modern by going digital. A variety of door labeling solutions are available on the market — but what exactly are users looking for? We investigate the trends to find out what is most important to users when it comes to digital meeting room labels. Electronic signs in all shapes and forms are invading buildings, rooms and halls like boy bands took over the 90s. From smart interactive floor plans that provide detailed wayfinding information to connected e-kiosks, billboards and tablets showing all the details for visiting a location, modern facility management is embracing the Internet of Things by going digital. If in the past even the most technologically advanced companies had to resort to paper schedules and attach them to doors that is no longer necessary and a meeting room labeling revolution is well underway. Vive la révolution! The market now boasts a wide array of digital door signage products availablewith solutions ranging from LCD screens to Ethernet-connected displays and mounted Android tablets, to everything in between. However, despite digital door labels overflowing the market like the cheeky little Minions you see on every corner, there are still a few key characteristics a good digital label has to satisfy. Choosing a labelling display is closely tied to one of the simpler and most basic questions of using an electronic door sign: Where is it going to be? Which surface will it be attached to? Glass is the installation surface of choice for almost half of door sign users. Let’s not shatter that ceiling. In the past, the answer might have univocally been brick, plaster or another type of wall, but the advent of modern, bright and open offices with unorthodox floor plans and versatile building materials has made installation surfaces somewhat more diverse. We now have variety, but it’s proven tricky. There’s the need for a one-device-fits-all solution. Digital door label users prefer wireless solutions that can be mounted easily, without drilling, hammering and the racket that goes with them. This is especially true for surfaces such as glass, a popular choice among venue proprietors. Even with traditional concrete surfaces the installation of a wired door label can be difficult. Adding a single label can call for a major office renovation with a whole crew of workers; and don’t even think of putting the label on the door itself or another non-traditional material. Case in point: In modern offices, glass is progressively becoming the installation surface of choice. While you can hammer away to the tune of the seven dwarves if you want to mount a cabled room booking screen on a brick wall, that’s not an option when it comes to glass, wood (another popular choice) or another similarly challenging surface. People are actually turning away from brackets, screws and bolts and choosing light, wire-free door signs that run on an independent power source and fit just about anywhere. Seamless solutions don’t require heavy drilling or ingenuity to mount (think velcro strips and double-sided tape). This leads to the next dilemma in door signage: a cordless room-labelling solution that hits the mark in just about any installation scenario can fail horribly when it comes to battery life. It’s a definite deal breaker. 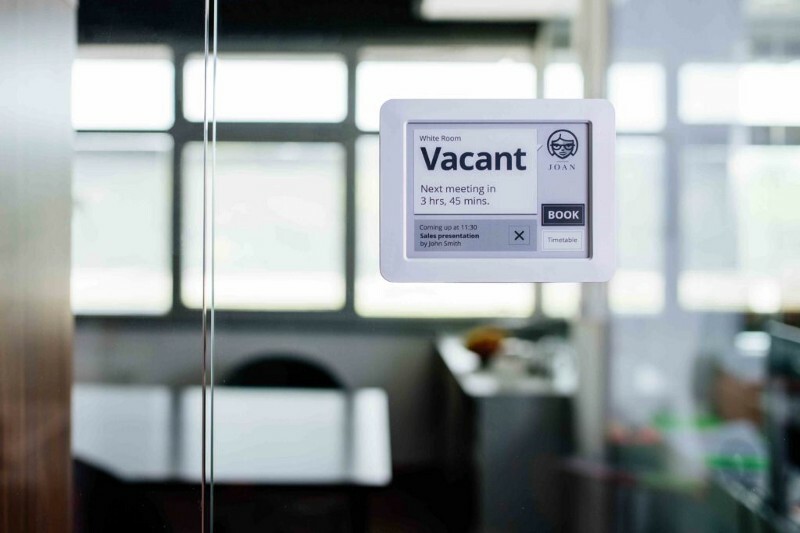 A popular attribute of digital door labels is booking or canceling a meeting right on the spot, on the display itself. The other one is power efficiency. Users expect to use the device without having to recharge it for at least a couple of weeks. An independently-powered room booking solution therefore needs to be able to successfully sustain the heavy traffic of office or conference hall use while featuring excellent battery autonomy. With the brightly-lit LCD screens of the past, power efficiency might have proven difficult to attain; in fact, there are still door labeling solutions out there that fail to reach the mark in terms of battery life. In every office and across large campuses especially, a door labelling sign’s power economy is the peanut butter to the jelly sandwich of selecting a door label. 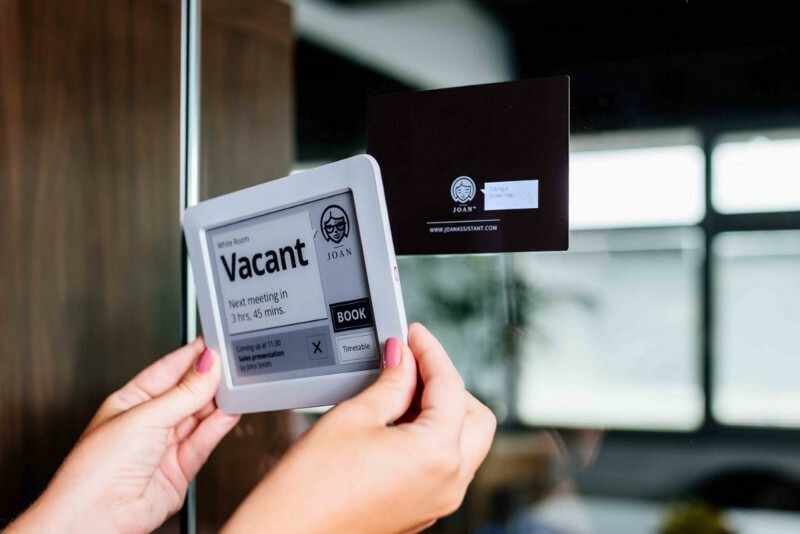 The development of new, energy-efficient technologies (such as e-ink, using power only when the image on the display changes) coupled with the advent of green, sustainable offices has given birth to door labelling solutions providing a long-lasting battery for a happy user. A user-friendly interface and the functionalities it allows in handling room booking are the key Jenga blocks in the tower of facility management. A significant, must-have feature is the ability to book or cancel a meeting right on the spot, on the display itself. 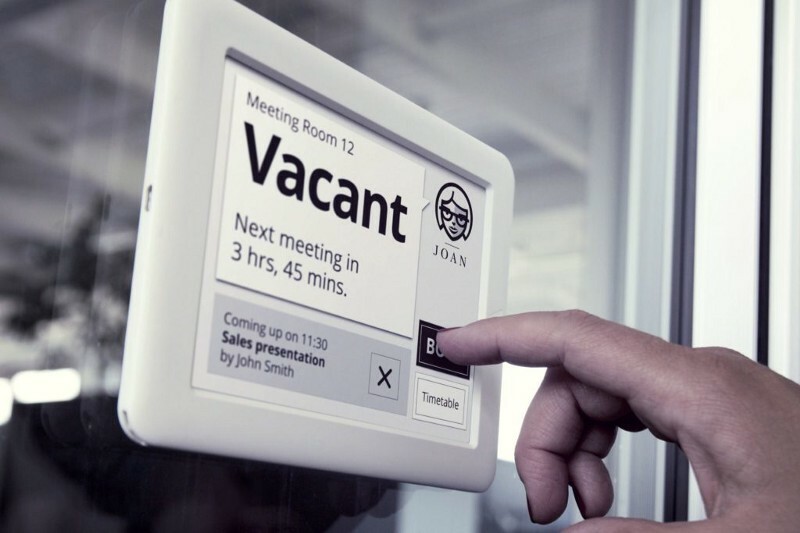 Instant booking at the meeting room door, without the aid of a phone or computer, is vital to many users when deciding on a room signage product. And while this functionality is more than welcome, it can also drain device power. Door signs running on an independent power source are battling it out Hunger Games style for an extremely power efficient solution. The market screams for a solution that provides booking at the meeting room door as well as a list of upcoming meetings shown on the display itself. Another welcome feature when selecting a door label is its compatibility with the tools and programs the people are already using, such as different online calendars. This, however, doesn’t mean that people want to keep using these tools to decipher which events are coming up; a door label should do that for them. Users want a simple solution to communicate meeting room availability, one that adapts to their existing software and requires no additional devices or figuring things out. In fact, two thirds of door label users opt for devices which provide booking transparency and display a list of meetings coming up directly at the device. In short: they are choosing solutions that are easy to use and require no additional devices to relay the existing availabilities of the space to be reserved. A lot of the time users want to host the sign software themselves, using their own infrastructure. They don’t wish for the software supporting the door labels to be hosted elsewhere. Since room booking software had traditionally been a complex affair with on-site servers and the lot, a number of users are reluctant to use the Cloud for meeting room management. For them, the Cloud is just a cloud and they might need some help in implementing the signs. To please both types of signage users, the seasoned developer at a tech company and the analogue-prone office manager, the ideal door signage product would have to feature software that is both compatible with the users’ existing meeting scheduling software which can run on client’s proprietary infrastructure or in the Cloud.